Smaller Glasses for Bigger Profit? | Best London Pubs by The London Pub Crawl Co. Smaller Glasses for Bigger Profit? Troy sent though an interesting Guardian article the other day about bars being allowed to serve alcohol in smaller glasses. On the face of it, this seems reasonable. But hold on, the article stated “the government said it was scrapping complex regulations that dictate the measures sold on licensed premises.” Now if pubs are not required by law to serve exact measures where does that leave you and I, the customers? 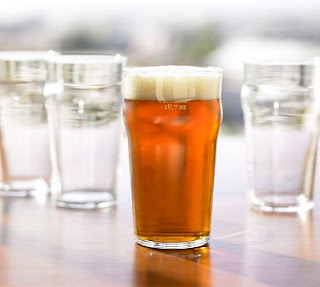 If there are no regulations on glass sizes, then how can we be protected when buying a pint (56.8cl). Will it be a pint, or will it be 50cl? Will a half pint suddenly reduce 25cl? And we all know that the price will not go down! The move was welcomed by health campaigners, who said it would help tackle binge drinking by allowing drinkers to control the number of units they consume. Really? Personally I think that these people have their head in the clouds. Yes, it allows people to control the number of units they consume, and if you are a middle aged lady who wants a small glass of wine, then, yes it is great. But honestly, do health campaigners really believe that by having smaller glasses, younger drinkers will “control” their drinking. If anything it will make matters worse. I remember waiting for my friends to arrive at the pub and thinking “I don’t want to have too much before they arrive, so I’ll just get a half”. Well, that half a pint of beer slipped down way too easy, so I ordered another half. Sipping away and reading the paper, my glass became just under half full, so I knocked off that little bit of beer and got myself another. From a perspective of not wanting to have too much before my friends arrived, I actually ended up having 1 and a half pints. My friends arrival saw me being bought another pint. Half pints are fine and here at the London Pub Crawl Company we recommend a half pint in each of the pubs on our Free and guided crawls. But thinking that young drinkers will moderate their drinking with smaller glasses, not out with their mates they won’t! This entry was posted in Pubs and tagged Customer rights, glass size, Health issues. Bookmark the permalink.